Second-grader Trent enjoys swinging on his tire swing and going on walks and hikes. His parents say he’s very active and always on the move. “He loves balloons,” adds Dorothy, Trent’s younger sister; specifically, letting them go and watching them float up into the sky. Trent has autism and has been receiving therapies since the age of two. Now at 8 years old, he’s adjusting to life with a furry helper by his side. 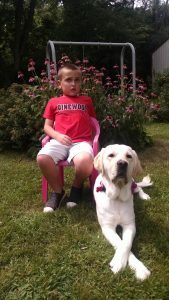 Trent’s parents, Kelly and Paul, got Trent on the Can Do Canines waiting list when he was 3 and a half. “With autism, there’s a waitlist for everything,” says Kelly. In May of 2018, he was matched with Georgie, a loving Golden Retriever and Labrador Retriever mix. Trent wears a belt that connects to Georgie’s cape and he holds onto a handle that’s also attached to her cape. Although he will occasionally drop the “Georgie handle” if he sees something that really interests him, he can’t bolt because he’s still connected to her with the belt. If he tries to run, Georgie plops down and stays put, making sure Trent can’t get away and allowing Kelly or Paul to help get Trent back on track. Although Trent doesn’t enjoy the slobbery kisses Georgie gives, he loves brushing her and petting her soft coat. “[Georgie] is anxiety relief for [Trent]. He visibly shakes when we’re at clinics. But he pets her and she calms him down,” says Kelly. In addition, Trent likes to cuddle up under his weighted blankets and say, “squish me,” to which Georgie replies by jumping on the bed and putting her weight on him. So the next time you see a balloon in the sky, floating by as free as can be, perhaps it’s a message from Trent letting us know he feels free too. You: Thank you for your donations!